We have completed hundreds of high-end and modest projects in Central Florida at various price points over the years. We work with architects, builders, project managers, other contractors, and personal assistants on a daily basis. We hold all state, county, and city required credentials needed to legally install landscape lighting including an electrical license, insurance, bonds, contractor licenses, and occupational licenses. Although we have completed some of the largest and most elaborate lighting projects in Windermere, Winter Park, Baldwin Park and Central Florida, we also offer modest systems at various price points. Whether you need a few pathlights or an entire estate illuminated, we are here to help. We carry a wide variety of professional and commercial landscape and outdoor lighting products and various price points. We are happy to discuss all the advantages and disadvantages of each. We even offer retail product sales for the DIY homeowner. 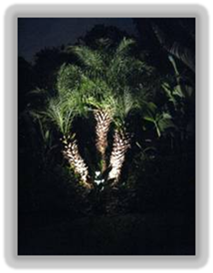 Moonlight is a small local family owned landscape lighting business that has specialized in landscape and architectural lighting here in Central Florida for over 25 years. Our founder and president, John D. McKenzie, earned his college degree in horticulture and held numerous management positions before starting our company in 1990. His son (John Jr.) joined the company in 2000. Almost all of our business is residential and comes from existing clients and referrals from satisfied customers. We have completed hundreds of both high-end and modest projects at various price points. We have and will always provide the same outstanding customer service and respect all of our clients regardless of their project or home size. Whether you need a few path lights or an entire estate illuminated, we are here to help. Over the years, Moonlight has designed and installed everything from small systems for condo owners to huge systems for large estates. No job is too small or too large. After meeting with you at your home, we will be happy to give you references located in your neighborhood. bonded through Orange County for performance. We have designed and installed landscape lighting systems for every size home ranging from small condominiums to large estates valued in excess of $10,000,000. We are well known and often referred in some of the most affluent neighborhoods in Central Florida including: Isleworth, Lake Butler Sound, Keene's Pointe, Baldwin Park, and Winter Park to name just a few. We are proud of the fact that there are streets in these neighborhoods that have more MOONLIGHT systems than not. There are very few companies in Central Florida that can properly design and install a balanced lighting system for a large property that might require over 100 fixtures. Of course, you do not have to own a mansion to enjoy the advantages of professionally designed and installed landscape lighting. For us, no job is too small or too large. If you show us a quote, we will beat the overall value. We will discuss in detail, line by line, the differences in quotes and what you are getting for your money. It is very important to compare "apples to apples." With over 25 years of experience in Central Florida, we can provide you with solutions within your budget. A fixture cost can vary from $20 to $320; a transformer can vary from $50 to $1050. It is very important to know what exactly is being specified for the project and why. In Florida, landscape lighting installation requires a state issued electrical license as well as electrical insurance. In addition, in Orange County, landscape lighting installation requires a county electrical contractor's license as well as a performance bond. We have all of these qualifications and more. Even if you do not choose us, we highly recommend that you choose a properly licensed and insured company that has been in business here in Central Florida for more than a few years. We will provide you references and a copy of our credentials when we meet with you to discuss your project. As you can see, lighting can make a dramatic impact when designed and installed properly. In addition to lighting a trees or statues, it also adds safety and security. Notice in the pictures, there are not any coach or porch lights on yet you can still walk up the sidewalk and get to the door just by having the ambient light and one dedicated path light. Path lights are also used to light flowers or in this case a security system sign. The brick column fixture lamp is 24 degree 20 watt MR-16. It was specifically designed in this installation to not spill over the width of the column or to take away from the palms being featured. Experience and details make all the difference. We use several different landscape lighting techniques to create the atmosphere you desire. Path lights are used to light sidewalks, flower beds, or other items on the ground. We used various sizes of pathlights depending on the application. A professional pathlight can produce enough ambient light to effectively illuminate up to 10 feet of ground. So basically 50 feet of sidewalk may only need 4 or 5 pathlights to create a safe walking area. Because these lights can spread 360 degrees, lining the sidewalks with colorful flowers, can be a beautiful addition for both day and night. Deck lights are used to light the walking around on a deck or dock. They are small and inconspicuous but do the job a path light would on a sidewalk. We have completed countless deck and dock projects here in Windermere, Orlando, Winter Park and Central Florida. A nice transition is to use path lights on the path to the dock and then deck lights on the dock itself. Step lighting can be accomplished in several different ways. Depending on the design and stage of construction, we can provide different solutions. For example, under construction of the steps, we can install the lights themselves into the steps. This is most commonly seen in commercial applications. We can also install deck lighting to shine down from the rail unto the steps. A third option is to use path lights. We offer custom length path lights which can be used to light two or three steps from the ground level. Graze lighting is most often used to light an architectural feature in the same method as uplighting a tree. Columns and arches are highlighted from below. Since we carry so many fixture and lamp options, we have the ability to accent a feature without flooding the entire area. Wash lighting is probably the most subtle lighting technique. We use wash light fixtures to illuminate a large area with a very subtle, diffused, even coverage accent. It is commonly used to light an entire side of a home or a decorative wall. It can also be used to create a silhouette of a tree or hedge by lighting a wall behind a tree without lighting the tree itself. We carry lines from Alliance, Brilliance, FX Luminaire, Garden Light, Hadco, Kichler, Kim, MilSpec, Unique, and Ushio just to name a few. We have also sold and installed many special order/custom made or "a"rchitect specified" systems from companies like B-K, Bronzelite, Winona, and others. With our long lasting ties in the lighting business, we can get just about anything you may need or want. We are happy to discuss all the advantages and disadvantages of each. As with normal fixtures, LED fixtures vary dramatically in both fixture quality and application. All LED products are NOT the same. We still install more traditional fixtures than LED due to the cost vs. savings but LED is becoming more and more popular among our customers. Due to the similar results of our high end LED fixtures, we can also mix and match with traditional for the best overall value. For example, our most popular LED deck lights are only $25-$50 more per fixture than our conventional version. There is no question that the professional landscape lighting industry is shifting towards L.E.D. lighting solutions. Professional L.E.D. fixtures consume as 40% - 80% less energy as conventional halogen fixtures. The lighting elements in L.E.D. fixtures can last as long as 50,000 hours (17 years at 8 hours per day) resulting in no lamp changing for entire life of the fixture. Professional L.E.D. fixtures often carry better warranties than their similarly designed halogen option. Our most used LED fixtures carry a 15 year warranty versus a 5 year warranty from the same manufacturer's halogen version. Considering the price of lamps, service calls, and warranty, many now see the value of LED. The left is a conventional halogen fixture and bulb, the middle is our high end LED fixture, the right is a common LED fixture. As you can tell, the light on the right is much dimmer and has less spread and very blue. Traditionally, lighting is a warm amber color not blue, gray, or green. Although conventional landscape lighting systems actually use much less energy than most assume, LED systems use much less. Landscape lighting systems use a transformer that reduces120v to 12v to power the fixtures. An average system can cost less than $1 per day to run. Our LED fixtures use 40-80% less than that. You can also mix and match depending on fixture costs and application. Imagine creating a beautiful outdoor lighting atmosphere every night for as low as $5-$10 per month in energy costs. We respect the DIY homeowner and offer most of our products to retail customers without installation. Installing the entire system yourself could save you 50% off of our standard installed pricing. We will work with you as much as you need to help you design and/or install your new system. For a few hundred dollars, we will even come to your residence, walk the property, and create a lighting installation plan specifying every detail with your input. We can even install everything and leave burying the wire to you to save you up to 20% off our normal installed prices. As you can see the solar light (left) illuminates as a marker whereas our path lights (right) actually light an area below the top of the fixture. Our fixtures will illuminate a 10ft diameter so you do not need near as many installed as you would need installing solar or Malibu style fixtures. We can also get custom lengths manufactured for steps, flower beds, address plaques, or in this case: an alarm company sign and a walkway. the focus should be on an area or specimen not the fixture itself. With our knowledge and over 25 years of experience, we can install your new system without destroying your existing landscaping. We have the qualifications required to work on a new construction work site as well. So regardless of the state of your landscaping, we can help. 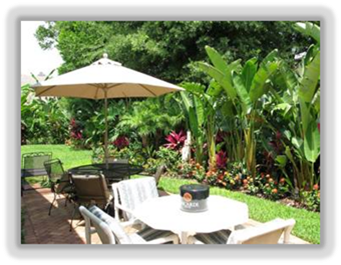 We work with your landscaper and other contractors to make sure the job is completed efficiently and properly. From 5 fixtures to 205, we can design and install a system for you that will provide you more security, more safety, and a beautiful night atmosphere. Whether you want to add one light or a multiple lighting zones, we can help. We will walk your property with you and discuss your desires. We will go through your entire system fixture by fixture before adding any lights to repair and evaluate the current status. Based on our findings, we will offer you options to help you achieve your desired results. After adding your new fixtures, we will review the system again to make sure everything is wired to code and working properly. If you are having issues with your system, look no further. In many cases, troubleshooting is harder than installing a new system. Our technicians take special pride in facing the challenge head on. Whether we put it in or not, we are here to help. We will repair your system efficiently and get it performing to its full potential within the budget you set. In addition, we will give you recommendations how to improve it in the future. Within just a few hours, it is possible for us to troubleshoot, repair cut wires, replace lamps and even repair fixtures. If you need more than just a basic service call, we can replace your old or damaged fixtures and lamps for less money than buying a whole new system. We offer proposals, estimates, or time+material cost agreements to refurbish your existing system. We can go through your entire system, fixture by fixture, wire by wire to get you the best overall value. Our knowledge and experience actually costs you less in the long run. Need a fixture or want to install your own profession quality landscape lighting system? We respect the DIY homeowner and offer most of our products to retail customers without installation*. In addition, we will work with you as much as you need to help you design and/or install your new system. For a few hundred dollars, we will even come to your residence, walk the property, and create a lighting installation plan specifying every detail with your input. In addition, we can even install everything and leave burying the wire to you to save you up to 20% off our normal installed prices. We carry a wide variety of professional and commercial landscape and outdoor lighting products that are not found at home improvement stores. We carry lines from Alliance, Brilliance, FX Luminaire, Garden Light, Hadco, Kichler, Kim, MilSpec, Unique, and Ushio to name a few. With our long lasting ties in the lighting business, we can order just about anything you may need or want. We are happy to discuss the advantages and disadvantages of each type of product. *NOTE: Due to agreements with certain manufacturers, some products are only available to consumers if they are professionally installed. Orlando, Windermere, Bay Hill, Dr. Phillips, Winter Garden, Ocoee, Gotha, Clermont, Oakland, Eastwood, Bithlo, Longwood, Oviedo, Casselberry, Lake Mary, Heathrow, Sanford, Conway, Belle Isle, Maitland, Winter Park, Baldwin Park, Altamonte Springs, Apopka, College Park, Hunter's Creek, Edgewood, Kissimmee, St. Cloud, Winter Springs, Deltona, Colonialtown, Delaney Park, Lake Nona, Metro West, Isleworth, Lake Butler Sound, Keene's' Pointe, Cypress Point, Phillips Landing, Heathrow Woods, Lake Nona, Bella Collina, Golden Oak and more. Thank you for taking the time to consider MOONLIGHT for your landscape lighting needs. Whether you need a service call, want to add a few lights, install a new 5 fixture system, or have an entire estate that needs a lighting atmosphere created, we are here to help. We look forward to speaking with you and helping to bring your lighting desires to fruition. Orlando also known as the city beautiful is known for its fantastic weather and architecture.ï¿½ Nothing can make an Orlando Florida home nicer than professionally designed and installed landscape lighting.ï¿½ Whether your landscape lighting is LED or halogen, whether your outdoor lighting involves copper path lights or normal pathlights, it will be much better if it is a professional outdoor lighting companyï¿½s work.ï¿½ Orlando is home to many beautiful gardens and docks.ï¿½ Without outdoor lighting or landscape lighting, these garden and docks and decks would not be highlighted at night.ï¿½ In Orlando, it is almost a crime to not have your properly illuminated by Moonlight landscape lighting.ï¿½ Orlando becomes more beautiful when professional outdoor lights and landscape lights are installed by a licensed company like Orlandoï¿½s own Moonlight Landscape Lighting.ï¿½ We light docks and decks and gardens with Kichler CopperMoon and many other brands here in Orlando.ï¿½ We have installed landscape lighting in Orlando for over 20 years.ï¿½ We are licensed to design outdoor lighting in Orlando and have been for over 20 years.ï¿½ We are also licensed to repair landscape lighting and outdoor lighting and garden lighting in Orlando Florida.ï¿½ Let us design an Orlando inspired lighting system for your landscape today.ï¿½ Being from Orlando, we understand what our clients in Orlando Florida want from their Orlando homeï¿½s landscape lighting system outdoors. 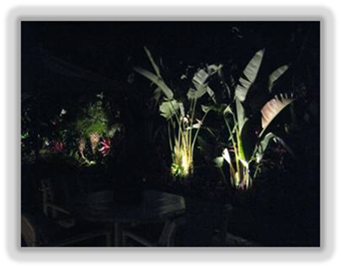 20 Years in Central Florida Providing Professional Landscape Lighting Design, Sales, Installation, and Servicing. Redefining the lighting industry by providing: more options, better service, better products, and better pricing! We have offered professional architectural, outdoor, and landscape lighting design, sales, installation, and servicing at all price points in Central Florida for over 20 years. We are a small family owned business that was started in 1990. We have all state, county, and city required credentials needed to legally install landscape lighting including an electrical license, insurance, bonds, contractor licenses, and occupational licenses. Over 95% of our customers are repeat customers or have come from referrals from clients, architects, or builders that we have worked with in the past. Less than 1% of our expenses are spent on advertising. We are very proud and grateful of our reputation and our customer loyalty. We have countless clients that have been with us for years and years and have had us work on multiple homes. We have even designed and installed systems in other states for our clients. We have designed and installed lighting systems as small as 5 fixtures and as large as 200+ at various price levels. We are proud to have completed some of the largest and most elaborate lighting projects in Windermere, Winter Park, and Orlando. Having designed and installed some of the largest lighting projects in Central Floridaï¿½s history as well as many small modest systems, has made us well known and referred in some of the most affluent neighborhoods in Central Florida including: Isleworth, Lake Butler Sound, Keeneï¿½s Pointe, Phillips Landing, and Baldwin Park to name just a few. We service what we sell as well as what others sell. Our technicians look forward to tackling the challenge of revamping systems that have been ignored for years or even installed incorrectly by others. We even offer DIY options for new systems for homeowners who want to benefit from our quality and experience but want to be more hands on and save money. We have access to almost any outdoor lighting product available, including L.E.D. fixtures. We carry a wide variety of professional and commercial landscape and outdoor lighting products. These are not your average home improvement store items. We are happy to discuss all the advantages and disadvantages of each. Although this site is not fancy or flashy, we hope that you find it informative and easy to navigate. We are currently working on a new version. This site will be updated periodically until the new site is available. It is currently one long page that is laid out like a resume for ease of use. We have posted pictures of landscaping to show our lighting, instead of trying to impress potential clients with large mansions that we have worked on. We are dedicated to providing the best possible service, products, and value to all of our clients regardless of their budget. 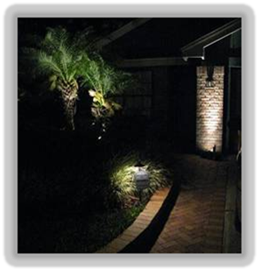 We are a small local family owned landscape lighting business that has specialized in landscape and architectural lighting here in Central Florida for over 20 years. Our founder and president earned his college degree in horticulture and held numerous management positions before starting our company in 1991. We have completed hundreds of high-end and modest projects at various price points. After meeting with you at your home, we will be happy to give you references in your own neighborhood. We are a state licensed electrical contractor. We are incorporated as a lighting company. We are insured for $2,000,000 for liability and have never had to file a single claim. We are bonded for Orange, Seminole, and Lake Counties through the Building Department. We are licensed as an electrical contractor to work in Orange, Seminole, and Lake Counties. We have both city and county office/warehouse occupational licenses. We are well known and referred in some of the most affluent neighborhoods in Central Florida including: Isleworth, Lake Butler Sound, Keeneï¿½s Pointe, Phillips Landing, and Baldwin Park to name just a few. There are entire streets in Central Florida that have more systems installed by us than all other companies combined. We literally have been referred by neighbor after neighbor on the same street or subdivision without any advertising by us. We have designed and installed numerous systems containing over 100 fixtures each and completed projects on estates valued in excess of $10,000,000. There are very few, companies in Central Florida, that can properly design and install a lighting system of that magnitude. We work with architects, builders, project managers, other contractors, and personal assistants on a daily basis. Our goal is to bring quality products and workmanship to homeowners who desire a better overall landscape lighting system than what is available from the home improvement stores, handymen, and lawn care associates. 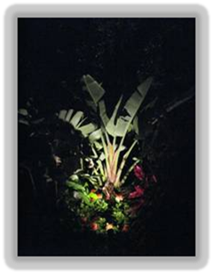 We are very confident that we offer the absolute best value in landscape lighting. We will do whatever is needed to beat the overall value of any written quote from any of our competitors. Show us a quote and we will beat the overall value. We will discuss in detail, line by line, the differences in quotes and what you are getting for your money. Honestly, it will be pretty hard to beat a quote by an unlicensed installer working under the table on the weekend. We will, however, design a better system and provide a better installation with better products at a great price and superior value. We are a real company, with a real office, a real warehouse, real qualifications, and real experience. PLEASE research the companies you are looking to hire. It seems like every day there is another company popping up to sell landscape lighting. Even if you do not choose us, please choose a properly licensed and insured company that has been in business here in Central Florida for more than a few years. If dealing with a franchise, ask for local client references that the current staff worked for. We will provide you references and a copy of our credentials when we meet with you to discuss your project. 1. Do they have the REQUIRED STATE ELECTRICAL LICENSE to install lighting? 2. Will an electrical license holder actually be on the job and review the installation? 3. What education and training do they have? 4. How long have they been designing and installing landscape lighting? 5. What products do they carry? What products have they quit carrying? 6. Do they have liability insurance that actually covers the installation of lighting? ï¿½Licensed and Insuredï¿½ is used so often that potential customers assume that everything is OK. Itï¿½s not. A ï¿½licensed and insuredï¿½ lighting installer may simply be lying about having his credentials or may just be a lawn maintenance tech that is licensed to have a lawn care business and insured to cut grass not install lighting. Florida requires no skill, education, experience, or testing to open or run a landscaping business. Landscape lighting installation, however, requires an electrical license and electrical insurance. In Florida, it is the same license and insurance that would be required to wire a home under new construction for computer networking, security cameras or audio video systems. We use several different techniques to create the atmosphere you desire. Up Lighting: Up lighting is probably the most common lighting technique. It is used to highlight a tree trunk and to shoot through the branches of the tree from the bottom. This effect gives a subtle and diffused lighting atmosphere. On large trees we use multiple fixtures to accent various portions of the tree and to allow the accenting to be viewed from each side of the specimen. Spot Lighting: Spot lighting is used to directly light the front of an object. It is commonly used for small specimens, statues, fountains, or flags. We use multiple fixtures when the object is very large or needs to be viewed from both sides. 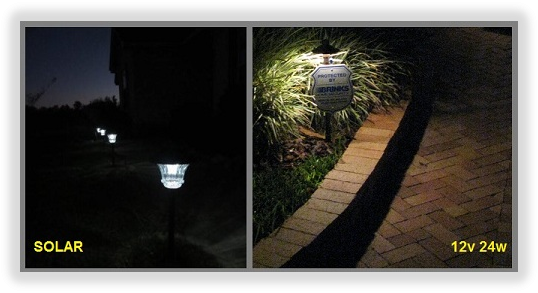 Path Lighting: Path lights are used to light sidewalks, flower beds, or other items on the ground. We used various sizes of pathlights depending on the application. A professional pathlight can produce enough ambient light to effectively illuminate up to 10 feet of ground. So basically 50 feet of sidewalk may only need 4 or 5 pathlights to create a safe walking area. Because these lights can spread 360 degrees, lining the sidewalks with colorful flowers, can be a beautiful addition for both day and night. Deck Lighting: Deck lights are used to light the walking around on a deck or dock. They are small and inconspicuous but do the job a pathlight would on a sidewalk. We have completed tons of dock projects here in Windermere and central Florida. A nice transition is to use pathlights on the path to the dock and then deck lights on the dock itself. Step Lighting: Step lighting can be accomplished in several different ways. Depending on the design and stage of construction, we can provide different solutions. For example, under construction of the steps, we can install the lights themselves into the steps. This is most commonly seen in commercial applications. We can also install deck lighting to shine down from the rail unto the steps. A third option is to use pathlights. We offer custom length pathlights which can be used to light two or three steps from the ground level. Graze Lighting: Graze lighting is most often used to light an architectural feature in the same method as uplighting a tree. Columns and arches are highlighted from below. Since we carry so many fixture and lamp options, we have the ability to accent a feature without flooding the entire area. Wash Lighting: Wash lighting is probably the most subtle lighting technique. 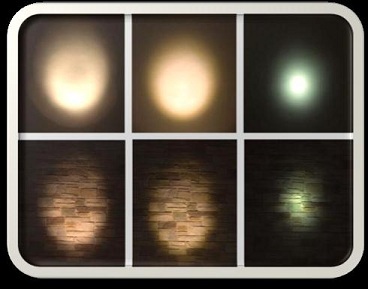 We use wash light fixtures to illuminate a large area with a very subtle, diffused, even coverage accent. It is commonly used to light an entire side of a home or a decorative wall. It can also be used to create a silhouette of a tree or hedge by lighting a wall behind a tree without lighting the tree itself. There are literally thousands of different landscape lighting products available today. Fixtures from $10 plastic versions to $500 custom milled versions are available to consumers today. Being able to choose the best value out of thousands of products is not an easy task. With over 20 years of experience, we have seen and done just about everything related to our field. We have found out the hard way which fixtures will do the job and last the test of time and which ones wonï¿½t. In addition to fixture choice, there are other design factors to consider like: brightness, technique, function, and power consumption, not to mention building codes. Architectural and landscape lighting is really a very delicate balance of art and science. There is much more to creating an atmosphere than sticking a light near a tree. With as little as 10 specimens or architectural features to light, there are literally thousands of different fixture/bulb/technique combinations to choose from. We have a single accent fixture that can take 16 different lamps depending on the application and we sell no less than 10 different styles of fixtures depending on the application. Experience makes all the difference and we are here to help you. We carry a wide variety of professional and commercial landscape and outdoor lighting products. These are not your average home improvement store items. Years of experience have taught us that there is not a single manufacturer that makes the best product for every application. We really advise you to think twice if you have received estimates from others that only include one or two different manufacturers. We favor products that we feel perform the best and are the best value, not products that have yearly sales number commitments or rebate prizes. We carry L.E.D. as well as conventional halogen and incandescent fixtures. We are happy to discuss all the advantages and disadvantages of each. As with normal fixtures, LED fixtures vary dramatically in both fixture quality and application. All LED products are NOT the same. We still install more traditional fixtures than LED due to the cost vs. savings but LED is becoming more and more popular among our customers. Due to the similar results of our high end LED fixtures, we can also mix and match with traditional for the best overall value. For example, our LED deck lights are only $25-$50 more than our conventional version. The left is a conventional halogen fixture and bulb, the middle is our high end LED fixture, the right is a common LED fixture. As you can tell, the light is much dimmer less spread and very blue. Traditionally, lighting is a warm amber color not blue, gray, or green. We carry professional products by many different manufacturers including: Alliance, Hadco, Kichler, Kim, MilSpec, Unique, and Ushio just to name a few. We have also sold and installed many special order/custom made or ï¿½architect specifiedï¿½ systems with commercial quality products from companies like B-K, Bronzelite, Winona, and others. With our long lasting ties in the lighting business, we can get just about anything you may need or want. We service what we sell as well as what others sell. If you are having issues with your system, look no further. In many cases, troubleshooting is harder than installing a new system. Our techs take special pride in facing the challenge head on. Whether we put it in or not, we are here to help. It seems like every day a new lighting company pops up and one goes away. Some companies literally refuse to answer the phone after a new installation is complete and paid for. We have completed countless service calls for customers who could not get ahold of their original installers only to find out later that they were still in business. We will shoot straight with you and do whatever we can within the budget you set. We will get your system back up and running as quickly and inexpensively as possible. In addition, we will give you recommendations how to improve it in the future. We have performed service calls under $200 that included: troubleshooting, repairing cut wires, reset circuit breakers, replacing lamps and even repairing fixtures. We can bring new life into your old system. It is possible to replace your old or damaged fixtures and lamps for under $100 each if they were wired properly to begin with. We offer proposals, estimates, or time+material cost agreements to refurbish your existing system. We can go through your entire system, fixture by fixture, wire by wire to get you the best overall value. It is not uncommon to need a few fixtures replaced without the need of an entire new system. Our experience costs you less in the long run. We take our reputation and credentials very seriously. We do not cut corners and we follow all building and installation codes. Example 1: Proper wiring. We use landscape lighting specified wire and we design our systems so that circuits are uniformed, balanced, and have the proper voltage for maximum quality and bulb life. Example 2: Bulbs. We use the best lamps. We could buy generic MR16 lamps for under $1but we buy ones that are as much as $10. We use them because they are safer, more reliable, and last up to 10 times longer which result in less service calls and better overall value long term. Example 3: Fixtures. We choose fixtures that are specifically designed for each application. We use risers to adjust the height of accent and flood lights. Risers help prevent damage from landscapers and insects. In addition, they can be used in flower beds or hedges to light exactly what it was installed to light. This is just another step that we do that most others do not. We offer our professional products and services at multiple price points. We have designed and installed complete systems ranging from under $1,000 to over $50,000. We understand everyone has different needs, desires, and budgets. We are very flexible to your needs and can offer many different solutions. Since we will not sacrifice quality, the difference in price has more to do with future flexibility and the amount of labor involved. Below are just a few examples of how we can adapt to your specific situation. We walk your property with you and discuss all your needs. We give you at least three proposal options to choose from. We coordinate with your project manager, builder, or landscaper. We install your new system and walk the property again with you. We make any needed changes and show you how to operate system. We bury all wire and set the timers. Traditional "hands off" systems start as low as $149* per fixture including all design, labor, lamps, parts, transformer and labor. Price varies depending on type of transformer, type of fixtures needed, and overall layout. For example, solid copper path lights cost more than normal spot lights. Stainless steel transformers with extra power for future expansion and a lifetime warranty cost more than normal quality one. It is very possible to keep the price per fixture under $199* for a 15-25 fixture project even with copper pathlight and stainless steel transformer upgrades. We can just sell you products, help with design, teach you installation basics, or even install everything except burying the wire. An example of a $119* per fixture DIY system would include: (15) accent fixtures, (15) stakes, (15) lamps, (1) stainless steel transformer, 200 feet of wire, and property visit and design plan from our designer. An example of a $149* per fixture DIY system would include: (10) accent fixtures, (5) solid copper path lights, (10) risers, (15) stakes, (15) lamps, (1) stainless steel transformer, 200 feet of wire, and complete design and installation with the only exception being the wire not buried. * Every system varies depending on layout and products used. We guarantee our work, offer phone support, service calls, and maintenance agreements. Our products carry warranties up to 20 years or even life. We offer replacement lamps with new installations and a final fixture adjustment walk through after installation. We service the Central Florida Area: Orlando, Windermere, Bay Hill, Dr. Phillips, Winter Garden, Ocoee, Gotha, Clermont, Oakland, Eastwood, Bithlo, Longwood, Oviedo, Casselberry, Lake Mary, Heathrow, Sanford, Conway, Belle Isle, Maitland, Winter Park, Baldwin Park, Altamonte Springs, Apopka, College Park, Hunterï¿½s Creek, Edgewood, Kissimmee, St. Cloud, Winter Springs, Deltona, Colonialtown, Delaney Park, Lake Nona, Metro West, Isleworth, Lake Butler Sound, Keeneï¿½s Pointe, Cypress Point, Phillips Landing, Heathrow Woods, Lake Nona, Bella Colina, Bella Collina Golden Oak and more. We can also make arrangements to install a system for you at your local beach house or vacation home in the Bahamas. Thank you for taking the time to consider us for your landscape lighting needs. Whether you need a service call, want to add a few lights, install a new 5 fixture system, or have an entire estate that needs a lighting atmosphere created, we are here to help. We look forward to speaking with you and helping to bring your lighting desires to fruition. We are insured for $2,000,000 for liability and have never had a claim filed against us. We work with architects, builders, project managers, other contractors, and personal assistants on a daily basis. Architectural and landscape lighting is really a very delicate balance of art and science. There is much more to creating an atmosphere than sticking a light near a tree. With as little as 10 specimens or architectural features to light, there are literally thousands of different fixture/bulb/technique combinations to choose from. We carry an accent fixture that can take 16 different lamps depending on the application and we sell no less than 10 different styles of fixtures depending on the application. Experience makes all the difference and we are here to help you.